Freshly printed copies of the San Francisco Chronicle run through the printing press at one of the Chronicle's printing facilities September 20, 2007 in San Francisco, California. The five-day-per-week Bingham County Chronicle will serve Aberdeen, Shelley, Firth, Fort Hall, Blackfoot and other towns. IDAHO FALLS, Idaho — The publishing company that owns newspapers in Idaho Falls, Pocatello, Nampa and other Idaho cities is launching a new newspaper in Bingham County. The five-day-per-week Bingham County Chronicle will serve Aberdeen, Shelley, Firth, Fort Hall, Blackfoot and other towns, Adams Publishing Group said. It will be published in print Tuesday through Friday and Sunday. The announcement comes as many newspapers across the country have folded. 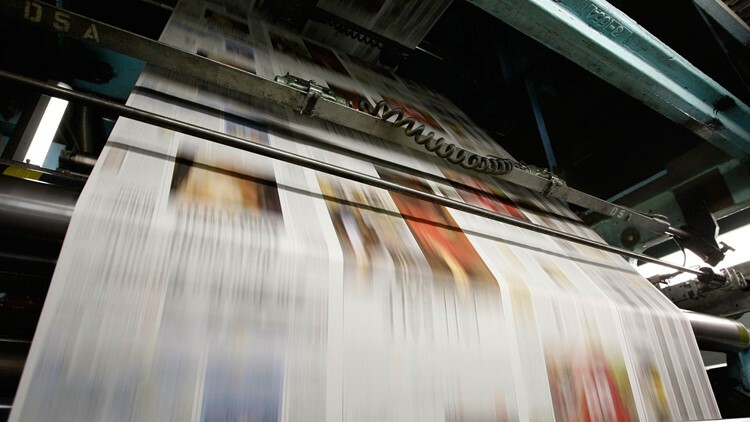 But the downward trend in the news media economy is affecting organizations in larger markets more than community newspapers, said Eric Johnston, Adams Publishing Group's west division president. "There's a good road ahead for community newspapers," Johnston said. "Markets like Pocatello and Idaho Falls and Bingham, residents in these markets rely on newspapers to get local information. We have a moral imperative to keep residents in these areas informed." The area is ripe for a new publication, Travis Quast, Adams Publishing Group regional president, told the Post Register . The region has seen reduced news coverage since the Shelley Pioneer closed in 2017. Bingham County Chronicle will be able to focus on "hyper-local" news, Quast said. "(The eastern Idaho group) has positioned us well to be able to leverage our resources from reporting and ad sales to circulation and production across that whole group to make us more efficient and stronger in the work that we do every day," Quast said. "With the network of 10 newspapers we already have across here, I think we're poised well to go in and put out a top quality product." The Greenville, Tennessee-based publishing group owns the Post Register, Idaho State Journal, Idaho Press and more than a dozen weekly newspapers in Idaho and northern Utah. The first edition of the newspaper will be released on March 5 and will be delivered to all Bingham County residents and businesses. The following day's edition will be delivered to subscribers. A subscription to the Bingham County Chronicle is $10 per month. The subscription includes a choice of either the Post Register or the Idaho State Journal as a companion at no extra cost. The newspaper will also be published online at bcchron.com.